I’ve ever posted about the real jealousy feeling that occurs in our marriage life. Yet this article explains more about how to handle and conquer the risky jealousy that may endanger one’s marriage. Many people said that jealousy is a sign of affection. 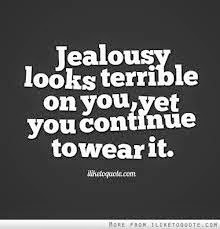 However, whether you aware it or not, jealousy can be the enemy that leads to a destruction. From a psychological standpoint, jealousy is a feeling of hurt, angry, disbelieving, and less confident against your loved partner. Commonly, this feeling arises when the husband or wife likes to imagine about the other partner who has a special relationship with someone else –beyond their knowledge. If the problem caused by the internal aspect, it may interfere a person's psychology and often leads to feelings of anxiety, worry, and suspicion against the couple. Conversely, if partners show negative attitudes like condemning and rebelling, they are said to indicate the character of the external aspect of jealousy. The lack of understanding and interaction between both married couple makes the problem becomes acute. Positive and negative effects may arise from this jealous nature. Jealousy in a marriage can be positive when it prevents someone from cheating on their partner. Still the possible negative effect can’t be taken lightly. Uncontrolled jealousy and mind often leads to treatment beyond the limits of humanity such as spanking, torturing and hurting the wife. That’s why a married person is needed to instill loyalty to their partner. Confidence, attention and love showered can reduce jealousy of the husband or wife. Behavior as a good wife or husband should be maintained and monitored at all times. The bond of marriage must have mutual trust between each other. So, before someone getting married, you should recognize first the partner well. It will help a man or woman for not to suffer from different problems after entering marriage life. If your partner-to-be shows excessive jealousy, you should think again if you still desire to build a more serious relationship since bad things can happen after you get married. A husband can’t simply blame his wife alone. Husband should act first to investigate the causes of the feeling of her wife’s jealousy. Naturally, the husband can’t act recklessly without any evidence as this will adversely affect in the long run to the marital relationship. From the psychological aspects; those who show big jealousy are generally less confident in themselves and often suspicious as well as worried to their partner. In addition, a person who has a bad past experience will always consider their partner unreliable. What can you do to prevent blind jealousy? You can apply things such as giving full of love and attention so that the husband isn’t suspicious, establishing effective two-way communication between both sides, telling whatever story happened either in the workplace or other places, avoid doing things that may lead to your spouse’s jealousy, and introducing close friend and work colleagues to your partner.